You are here: Home>Archive>Days of Pride Collection.>Collection of items relating to Arthur Lewis Lloyd.>Photograph of Lewis Lloyd in uniform. Photograph of Lewis Lloyd in uniform. 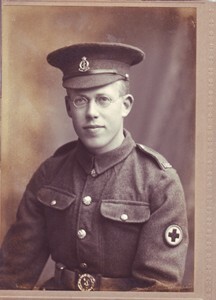 Black and white studio photograph of Lewis Lloyd in uniform mounted on brown card.